There was so much to be happy about in this game and yet there was this nagging doubt walking away from the ground that Sparta Prague were so completely abysmal, that it was difficult to draw any meaningful conclusions. That is the only negative in a night that I thoroughly enjoyed. I just love the whole Europa League experience. Some things were a bit more random than others, like the 'no beer' rule and if you wanted a soft drink, it had to be poured out of the bottle into a plastic pint glass. The weirdness extended to the standard 'Europa League' advertising boards placed in front of the expensive electronic advertising. One change that was nothing to do with the Europa League, was the two big screens at either end of the pitch have been changed to 21st Century Ultra High Definition. No more irritating missing pixels then. There were changes on the pitch as well, the officials come as a package of six, a referee two linesmen (Assistant Referees) and two 'behind the goals' Additional Assistant Referees and finally a Fourth Official. The funny thing was when the referee booked a player, he wrote the details on his notebook and so did all the other officials. It was like an Olympic sport - Synchronised Writing In A Book. They were all German for this match and seemed very efficient, with one notable exception that I will come to in a minute. When the team was announced there were no real surprises. Forster was in goal as usual. Martina and Targett came in as Full Backs and Yoshida replaced Fonte alongside van Dijk. Midfield was Romeu, Højbjerg and Ward-Prowse, with Tadić, Austin and Long up front. From the kick-off Saints were clearly up for it in their smart new Europa League shirts. The shirts were solid red at the back with the names and numbers in white. Much easier on the eye. The first surprise came within the first five minutes when there was a seemingly innocuous incident in the Sparta Prague penalty area the the ball appeared to hit one of the defenders on the shoulder and go out of play behind the goal. Immediately Charlie Austin appealed for a penalty, but the referee appeared to be indicating for a corner. Mr Gräfe then consulted with his linesman on the Itchen side and the 'Additional Assistant Referee' behind the goal (who must have had a perfect view). After what seemed an age the referee pointed to the spot. As if all this wasn't drama enough, Tadić and Austin then started a squabble over who would actually take the penalty. It turns out that Tadić was the nominated penalty taker, but Austin had the ball and wouldn't let Tadić have it. Van Dijk had the captain's armband for the night and he stepped in and ushered Dušan to one side. Austin duly stepped up and crashed the ball home. 1-0. To his credit, a beaming Tadić was one of the first to congratulate Charlie Austin. Dodgy penalty, or not, it quickly became apparent that Sparta Prague were just a shadow of their reputation and really not offering much. Fraser Forster was largely reduced to the role of bystander and only had a single shot on target to deal with all match. The goal seemed to settle Saints down and some of the football they played was excellent. Martina was standout at Right Back. In the absence of any real defending to do, he was left free to bomb down the wing and his crosses were superb. There were several other good performances, among which was Shane Long, who grafted all game long and took several knocks for his efforts. Before the game was half an hour gone, Saints were two up courtesy of a Charlie Austin nodded goal from a peach of a cross delivered with pace from the right. Claude Puel seems to have worked out how to get the best out of Austin in a formation that didn't seem to suit him. The future looks good. Meanwhile, back in the game, it was half-time and the crowd was relaxed, as it should have been. 2-0 up against a side that didn't seem to have any answer at all. The second half began and Saints seemed content to play possession football, leaving Sparta Prague chasing shadows. After a while they backed right off and the Czech's came back into things a bit and during this passage of play Forster was forced into making his one and only save of the match. On 70 minutes Puel started to reorganise and over the space of ten minutes Redmond replaced Tadić, Rodriguez replaced an exhausted Austin and finally Davis replaced the excellent Romeu, who had just got himself booked. The three substitutes, particularly Redmond, had an immediate effect in stepping up the threat on the Sparta Prague goal. 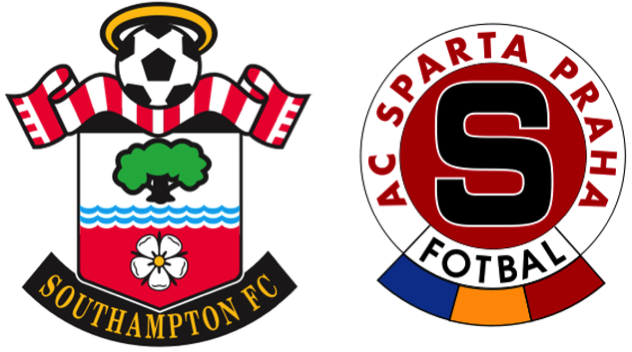 It was not until deep into time added on, that the elusive third goal came, with some wonderful interplay between at least five Saints players, before being finished off by Jay Rodriguez with a simple tap-in. At last the scoreline reflected Saints total superiority. So, thanks in part to Inter Milan's unfathomable loss to Hapoel Be'er Sheva, Saints sit proudly at the top of Group K. One down and five more to play. Next game in the Europa League for Saints is away to the aforementioned Hapoel Be'er Sheva. H'mmm. So, Saints had their first win under Claude Puel and blimey was it emphatic! I guess we might get an idea if it has got the monkey off their backs on Sunday, when Swansea come to town. For now I am just happy that we are up and running.